With wider use of cardboard display stands, more and more companies choose cardboard display stands for product promotion. Among all feedback ECO has received, the biggest problems that customers have are difficult assembling, non recyclable plastic accessories disposal and high cost. ECO POP UP Display 2.0 could solve all those troubles. 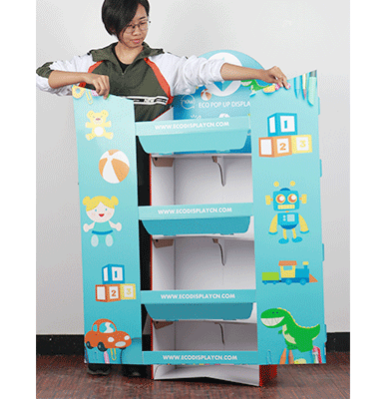 Compare with the ordinary cardboard display, this stand can be assembled within one minute. Just three steps needed. Only cardboard material used, you don't need to waste time to dispose the plastic accessories. It's 100% degradable, save time and cost as well as. This stand can dressing up, change the out-look for multiple brands promotion. It's convenient for different products or seasonal promotion. Each layer can hold over 8kgs products. If cardboard cross bars added, weight can be over 14kgs. So, you don't need to worry about it's load-bearing capacity.